I had a knitting epiphany this past weekend and it only cost me $85.32. I am no longer a timid, fearful, insecure knitter who only likes to knit what feels safe and easy (hats, scarves, some more scarves and a washcloth or two). 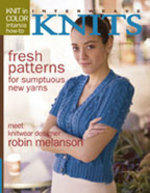 And I have my two blogging, knitting gurus to thank, in part for this wonderful evolution that is taking place in me. Let me tell you a little story. I knit as meditation, relaxation and haven't ever wanted to think too hard while sitting with my yarn and needles. I also had this mental block that anything other that learning how to knit and purl was beyond me, too complicated and would take the fun out of the process. Many months ago, though, I decided I wanted to knit and felt myself a purse. I thought and planned and perused many a skein, hank and ball of yarn to find the perfect fit, something fun, yet practical...something stylish and funky, yet timeless...the perfect yarn. I also sought out every purse pattern possible, because I would settle for nothing less than the grooviest, though usable style. Here's what happened...I bought no yarn, found no pattern and felt anxious every time I considered investing in "THE PURSE". It began to feel as if this project was the end all, be all and I was too afraid I would screw it up or buy some expensive yarn that I hated and make a lumpy, poorly shaped bag that would gather dog hair and dust on the floor of my closet. All the while I have been reading this blog daily, unable to spend the time and energy participating with my own posts, because all of my spare energy was focused on "THE PURSE"...the creation that would define me as a knitter and maybe as a person! What I realized as I read your stories was that you have to take a leap....a leap of faith that the yarn will work out (or not), that the pattern will turn out (or not), that there is always another project (and I could just buy a damn purse). I have enjoyed reading about your struggles and tribulations with the project you have embarked on. Barbara with your fearlessness in the face of frogging and Sara with your determination to make the best out of any mistake. You both have such creativity, fortitude and passion about your knitting and your lives; it is wonderful to get to know you both in this new way. I found my yarn (Noro Kureyon # 164) and made my own pattern...with help from the both of you. For the first time I knitted a swatch and measured my gauge (though I was semi-forced, I thank you much for the encouragement and insistence that it was the best way to go...you were right and now I have a cute little felted dollhouse rug). I knitted and I frogged and knitted and frogged again, then I knitted in the round like crazy and couldn't seem to get enough...my bag went everywhere with me and as it striped and grew, I doubted that it was what I wanted and thought maybe it was not going to work and as it grew more, I fell in love with the way the colors changed subtly, but the stripes appeared boldly and distinctly. I fashioned the strap instinctively, deciding to throw caution to the wind and go for it, without measuring a thing. I wove in the edges and embarked on my felting. "THE PURSE" is still in process...it needs some more felting, the shape is not quite what I planned on and the strap is too long. I want to line it and add a zipper or some other closure before it will be done and ready for official use. So it isn't perfect or the ultimate, but I absolutely love it and decided to go ahead and try it out, unofficially this past week. I have received many compliments and feel happy with my big old bag over my shoulder. I walked into the yarn store (where I bought the #164 because there was a hat knitted in the same yarn and I loved the colors, browns, ochre, teal and green...very earthy) this past weekend with my purse by my side and felt excited and proud and eager to begin my next project, eager to enhance my skill and try new things...play with new yarns, learn intarsia and make a Clapotnik (I know it is really a clapotis). I feel freed from my anxiety and my worry about wasting money on something that may not turn out...not wanting put in the effort when the return may disappoint. For the first time I walked into the yarn store and didn't feel overwhelmed or intimidated, frozen by the number of choices and insecure about my KQ (think IQ, except with knitting). Instead I felt excited about the possibilities that lay before me...I felt the potential that exists in each hank and skein and I picked up many of them, bought quite a few and have begun my very own stash! I have some projects in mind for some of the yarn and nothing in mind for the others. I am excited and relieved and much poorer than I was a few days ago...I am on a journey with needles and will weave my story as I go. The spring issue should arrive at your door within the next few weeks. We hope you enjoy it (and photocopy the good parts for us :). Have a very, very, happy birthday! Yesterday I spent the day at a workshop about Dependency Law (concerning children who have been abused or neglected). Other than having an uninterrupted chance to knit and for one incredible story, the day was pretty much a bust. I had been knitting a scarf from some Noro Silk Garden in a basketweave pattern. The yarn has greens, grays and some teal, very different, but beautiful. I had been using a single strand on size 8 bamboo needles. The yarn is uneven and the result was some parts that knitted up beautifully, with others that had big holes. I frogged the scarf and started a hat (Hot Head) though my needles were too small and too short for the job...I made it work and used two strands. The natural striping of the Silk Garden has been interrupted, because my two balls of yarn are not in sync, but the result thus far is a cozy, soft, pleasing panel of 2x2 ribbing that may make a hat that is too small for most people I know. As I sat at my table amid lawyers, social workers, CASAs, probation officers and the like and the yarn ran through my fingers, a woman named Cheryl Jacobson (www.cpyp.org) who works to find permanent connections for children in foster care spoke. She tries to find family and build relationships for children who have been in the system and are deemed "unadoptable". She talked about a 17 year old girl who had been in 28 different foster homes in her life and had no connection with her birth family. When asked if there was anyone that she would like to see again, anyone at any time in her life who she would want to reconnect with, her answer was that she didn't think anyone had ever loved her. They continued to talk and Cheryl asked if there were any teachers she remembered fondly (this girl had moved many times as a child, her mother trying to stay one step ahead of Child Welfare). She stated that teachers never liked her. Cheryl insisted, going grade by grade, trying to jog this young woman's memory to anyone she might have had a connection with at one time. Finally, the girl remembered her kindergarten teacher and for the first time in the conversation she looked up from the floor. She told Cheryl about how she would get teased by the other students for being dirty and her teacher would hold her and rock her. She remembered her name, "Miss May." Cheryl went on the hunt. After many twists and turns she located the school where this girl had gone to kindergarten and no one had heard of the teacher. A district wide teacher training was occurring and Cheryl requested to speak in front of the group for a few minutes. She told the story and a gasp went up in the back of the room. The kindergarten teacher's best friend was there and recognized that Cheryl was speaking of her friend. She said that Miss May married that same year and had changed her name which was why the school did not remember her. She told Cheryl that Miss May was retired, but agreed to phone her. After explaining the situation to Miss May, her friend handed the phone to Cheryl. Cheryl explained the reason for the call. Miss May was silent for a time and said that there was not a day that went by that she hadn't thought of that little girl and she often wondered about her. Miss May was never able to have children of her own, but nine months after that initial contact she adopted her former student and this young woman, who was almost an adult finally found her family. Well, I cried into my yarn right there in the Embassy Suites Ballroom and continued my knit 2, purl 2 routine. I have decided to give the hat to one of my very best friends (she has a rather shapely, smallish head) and is a part of my extended family.